How do I use YGG and GottaGo? Just pour it in! Instantly the powder rises to the occasion, creating a protective layer of foam that significantly dampens sound, splash and odor, while preventing streaks and stains, cleaning and reducing the spread of germs. The level of foam will vary from toilet to toilet. This is because the amount of water in a toilet and toilet sizes vary around the world. In every case, You Go Girl! and GottaGo will perform as promised, or your money back. YES! Phosphate free, there are no harsh chemicals or disinfectants to harm sewer or septic systems. The patented You Go Girl® & GottaGo™ foaming agent is very biodegradable and has no negative implications to your toilet, septic or local sewer system. Is it safe if I get the foam or powder on my skin or in my eyes? Yes! Although you would not intentionally put the powder or foam in your eyes or rub it on your skin, there are no harsh chemicals to our formula. If you happen to somehow get it in your eyes, just rinse calmly with water and seek medical attention if irritation persists. Avoid breathing any of the powder, it reacts to moisture of course and you may briefly experience a tingling in your nose. If so, blow your nose, rinse with water if you feel necessary. Of course see a doctor if irritation persists. 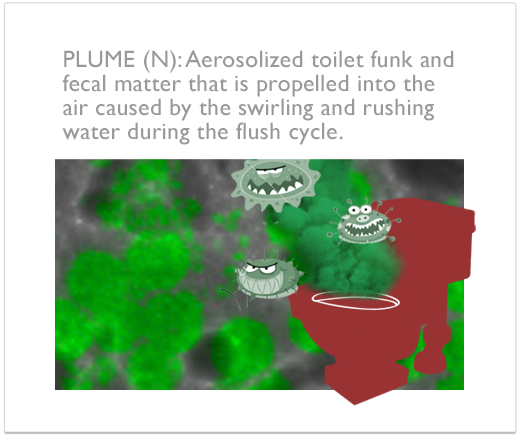 Basically when you flush the toilet, airborne particles of waste are spread around the bathroom. The You Go Girl! & GottaGo foam helps prevent the spread of PLUME by disrupting the swirling water when flushing. YGG & GottaGo work to prevent odor and waste from getting airborne. Will You Go Girl® work in water conserving low flush toilets? Actually, the You Go Girl! powder is designed to work best in modern low flush toilets. By increasing the effective surface area (in essence raising the water line) of a low flush toilet you'll notice you'll clean less because poop that would normally find it's way to the toilet bowl sides is captured by the foam. Especially important to people who struggle with IBD's such as Crohn's or post surgical patients.